The first test assesses blending skill. The ability to blend sounds efficiently is a phonemic awareness skill that must be learned. A very young child will often encounter problems acquiring the ability to blend sounds, and this will make it difficult for him to even understand what reading is all about. Until your child understands that print consists of a written code for the sounds of English, he won’t understand the reading process. And if he doesn’t understand the reading process, he will be prone to misconceptions. In particular, he might think that reading is about memorizing the overall appearance of words, instead of deciphering the code embedded in each word, sound by sound. The blending test is administered first because it makes the subsequent segmenting test instructions clearer to your child. The first test item is pig because almost all children who can blend at all can get the word pig. Find a quiet spot and sit across from your child so that he can see your lips. Tell him before you begin that you are going to say some sounds and you want him to tell you what word they make. Then say the sounds /p/, /i/, /g/, with a slight pause between each sound.Don't be surprised if your child finds some of the three-sound words in the blending test harder to blend than the longer words Ask him what word they make if he doesn’t immediately respond. Put a check mark on the line after pig if he got it correct, or write what he actually said on the line if he said something other than pig. A perfect blending score is 15 out of 15. The first nine items on the blending test are three-sound words, so you should be saying exactly three separated sounds for each word. Pearl, for example, is /p/-/er/-/l/. If your child has trouble with the three-sound words, this is a good indication that he has a poorly developed blending skill. Some of the three-sound words are actually tougher to blend than the longer test items. For example, pill will sometimes be blended as pickle, ran might come out ratten, and pearl often comes back as purple from children with weak blending skills. The next three words are four-sound words, but are actually no more difficult to blend than the three-sound words. If your child gets all of the three-sound words and misses some of the four-sound words, it is very likely because he is young enough that he doesn’t easily recall four items from short-term memory yet. This is also true of the five-sound words at the end of the blending test. 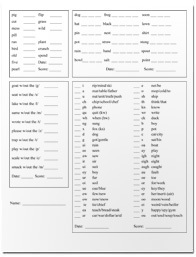 The last six items are sometimes more of a memory test than a blending test, although some children have trouble blending two consonant sounds.The four and five sound words test your child's auditory memory capacity as well as his skill at blending This will show up on the four-sound section of the phonics assessment test. Because decoding an unfamiliar word involves holding several sounds in memory at once, it will be more difficult for your child until his short-term memory capacity builds. Rather than worry about doing special memory exercises, be assured that the constant decoding being done in a good phonics curriculum will gradually build his short-term memory capacity. By the time he’s an adult, it should reach seven or eight items consistently, just to give you an idea of the scope of the short-term memory issue. Now, just so that there’s no confusion on how to present these test items, here are the sounds you should be saying for each word. See the Page Notation for the 43 Sounds if you’re unsure of the pronunciation for each symbol, but they should be pretty obvious since you already know the word. That completes the blending test of the phonics assessment. If your child struggled on the three-sound section, and struggling is missing more than one item, he is a poor blender yet. If he did fine on the three-sound words but missed the longer ones, especially the five-sound words, his short-term memory development could use some work. If he’s older, it could mean that he’s not used to blending sounds when he runs into unfamiliar words, but would prefer to guess. As a result, he hasn’t been exercising his short-term memory and its capacity is low yet. The next Phonics Assessment Test covers the essential reading skill known as segmenting.